Just over 60 years ago, in August 1949, a 15-year-old blind boy, Ved Mehta, moved to the United States of America to acquire an education. This was because his country of birth, India, offered no educational facilities to blind people. As a result, the blind had next to no employment opportunities back then (blind people worked as beggars, or lived on charity, or owned paan shops). Thus, the combined strength of negative social attitudes and structural barriers (lack of schools for blind children, lack of access to public transit, etc.) meant that most blind (like other disabled) people led lives mired in poverty and misery. I speak here about the education of the blind because I am a student who happens to be visually impaired. For me, technology means access to education and employment opportunities, contact with the larger world, and, entertainment. Both the radio and computer technology have played a major role in my life. As Ved Mehta writes in Sound-Shadows of the New World (1986), the fifth in his memoir cycle, the Continents of Exile series, while he was studying at the Arkansas School for the Blind in Little Rock, Arkansas, the radio allowed him to stay in touch with the outside world and helped him to conceive the idea of pursuing a journalistic career (he went on to have a long stint with The New Yorker as a staff writer). So, technology helped launch him on a writing career, and 60 years later, technology is integral to my life and career as well. When it was time for me to start my schooling, my parents sent me to the local school for “normal” children. Hence I did not learn Braille, which other blind children are taught at schools for the blind. My mother read aloud to me all kinds of books – school books, children’s literature, novels – right from early childhood till the completion of my undergraduation. She used to copy school notes and read them to me. I prepared for my examinations in this manner. Now I perform these activities with the help of my laptop. When I entered high school, my maternal grandfather introduced me to the habit of listening to the radio, specifically to the BBC (British Broadcasting Corporation). I quickly became an avid listener. This was fortunate, for it helped to broaden my horizons dramatically. Every day for seven years, I used to listen to broadcasts by the BBC and other radio stations starting early in the morning and after returning home from school and later, college. Programmes on the arts, sciences, current affairs, in-depth analyses of international political events, and so on kept me riveted to the radio. I even participated in an international radio-play writing competition hosted by the BBC. Early in this decade, when we bought a desktop computer, I was not able to use it. We were not aware of any assistive technology that would enable me to operate the computer on my own. However, this was to change soon. 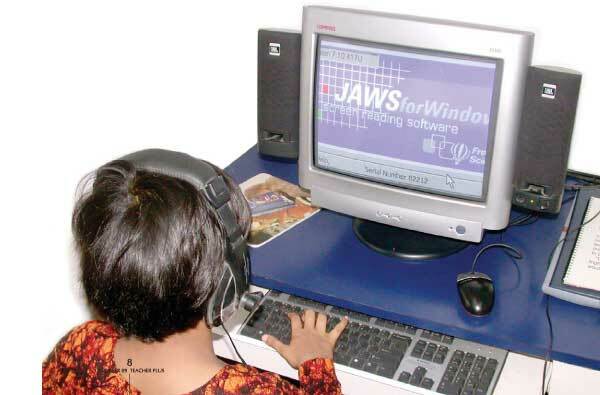 One day in 2002, my mother read an article in the magazine, India Today, about a screen reading software called JAWS for Windows, where the acronym JAWS expands to Job Access With Speech. This software has been developed by Freedom Scientific (www.freedomscientific.com), a company specializing in developing technology-based products to help the blind and people with learning disabilities to have equal access to information and computing, thus enabling them to improve their lives. Excited by the prospect of my achieving proficiency in using the computer, my parents bought this software. The purchase involved a considerable expense but looking back now, it seems entirely worth it. I learned to operate the computer independently with the help of JAWS for Windows and was soon busy surfing the Net and being amazed at the whole new world that was opening up before me. I even set up a personal email account. In June 2005, I wrote the entrance test to the Central Institute of English and Foreign Languages (CIEFL, now known as The English and Foreign Languages University, or EFLU) in Hyderabad and secured a seat. I was eager to do my M.A. there because their prospectus and website informed me that they offered special facilities for visually impaired students. These included computers complete with screen reading softwares like JAWS for Windows, and Kurzweil. This meant that I could be self-reliant in my studies. However, during my first semester at the institute, I did find it difficult to keep up with my assignments and other academic work, because it was not easy to find the required reading material in digital format. My professors and friends were very understanding and did their utmost in helping me with my education. On the advice of Dr. Rajiv C Krishnan, one of my lecturers, I purchased a laptop early in my second semester. He said that it would be of great help in my studies. Looking back, I think it was the best thing I could have done. From then on, I did all my academic work on my laptop. My teachers gave me the required readings in digital format and allowed me to take all exams using my computer. A friend who uses JAWS for Windows for his professional work once told me that the software would enable blind people to perform all computer-related work as well as (if not better than) sighted people. I know that he is right. But I am aware that all blind people do not have access to technology-based products because of the costs involved in procuring and using them. I know of visually impaired students who were not able to do well in their studies solely due to this reason. So in our country, I think it is the responsibility of institutions devoted to imparting education to make sure that visually impaired and other disabled students gain access to technology at the right times, thus enabling them to build their careers with greater success. Thus, like Braille, which was a great innovation, technology-based products have the capability to improve the lives of blind people. This is certainly true in my case. After finishing my M.A. in English literature, I am now on the verge of completing my M.Phil from EFL University. My research work was made possible by the online library, questia.com. I have been able to gain higher education due to computer technology. And now, I listen to BBC radio on the Net. The author is an M.Phil student at the English and Foreign Languages University. He can be reached at aravind.ciefl@gmail.com.